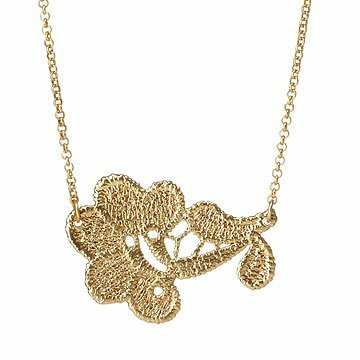 Make a romantic statement with this gorgeous necklace made from gold-dipped lace. Romantic floral lace gets an even more elegant upgrade in this beautiful necklace designed by Tulianna and Alejandra Garces. In an intricate handmade process taking several days, Colombian artisans transform lace into stunning, finely-detailed jewelry. Delicate pieces of lace are cut and sewn, then dipped in wax to seal and reinforce the stitching. After being first dipped in copper and then lustrous 24kt gold, the necklace is then brushed by hand to make the lace detail stand out. The result is a glittering tribute to the traditional art of lacemaking, and a gorgeous statement to add to your accessory collection. Handmade in Colombia. I like how unique this is and beautiful!! Can't wait to wear!! Our Aunt Nonie lives in a different state, so I haven't seen it myself, but I've ordered jewelry from Uncommon Goods and am happy with my purchases. Aunt Nonie sent us a thank you card for the necklace and I'm sure will see it the next time we visit.